Plumbing Services in South Florida for over 20 Years. Serving South Florida for over 20 years! We strive to be the best in the industry and provide each customer with 100% satisfaction. I'm extremely happy with the service I've received from Southern Coast! I've had an emergency and needed electrical service after hurricane Irma. They showed up promptly, were very professional and respectful. Price was very reasonable. Highly recommended. After hurricane Irma FPL restored power to our neighborhood. After they restored it we noticed that we did not have full power to our home. We had another electrician out before calling them and they told us that we had almost $5000 worth of work. I told him that I needed a second opinion so that's when I called around for another electrician. That's when we stumbled upon Southern Coast on yelp. They were one of the only ones to pick up the phone. Before the chris tech arrived he called me to give us an ETA of his arrival. Upon his arrival he began to diagnose the issue that we were having. He found that the main breaker was burnt on one of the lugs. He said he had those breakers at the shop and he could run and pick it an then come back and put it in. When he came back he took out the old bad breaker and put in the new breaker very quickly. He inspected the whole service and told me everything was pretty much in good standards. We felt very comfortable with Chris and Southern Coast and would highly recommend them. Chris was professional, polite and came out right away on a Wednesday evening. I would recommend them to anyone needing repairs. Used them for some electrical work and they were very reliable and professional. I world definitely recommend them in the future. Wow service for me that's for sure. I had my AC blowing out hot air and we were practically cooking inside our home. It was Saturday night around 6:45 and was not think I would get service this late on the weekend. We called several other air conditioning company's and either they didn't answer or they had no one available. We then found Southern Coast and I felt like I known them already cause we always see there trucks all over the place. The lady I think her name was Angel was really sweet and told me she will be sending LT out to check what's going on. LT called me about 20 min before to tell me his eta. When he arrived I just showed him were the AC was and he did his thing. He found out that a component in the air condenser went bad and that I needed to replace it. He told me the prices and I agreed to the price. He then went to Jos truck and grabbed what he needed and in less than 15 minutes we had AC again. This company is well worth every dollar from the initial phone call to giving my credit card it was over all an awesome experience. Here's the kicker on Tuesday they followed up to make sure that everything was fine and was I happy with the work. Well of cource I was. She also told me all the other things the company does witch pretty much is everything. She set up Mike a sales guy to come take a look at my kitchen and master bathroom cause it's old and outdated. Check out our real Yelp reviews from happy customers who are raving about our service. The best and the brightest in Boca Raton! If you need an electrician, give these guys a call and you can consider the job as good as done. We were pleasantly surprised with how easy and affordable Southern Coast made it! They even hauled all of their debris! We are glad we found Southern Coast and would recommended them highly. We have always heard of Southern Coast’s great reputation. We decided to give them a try, and boy was I glad that we did! LIFETIME GUARANTEE ON ALL SERVICES AND REPAIRS! 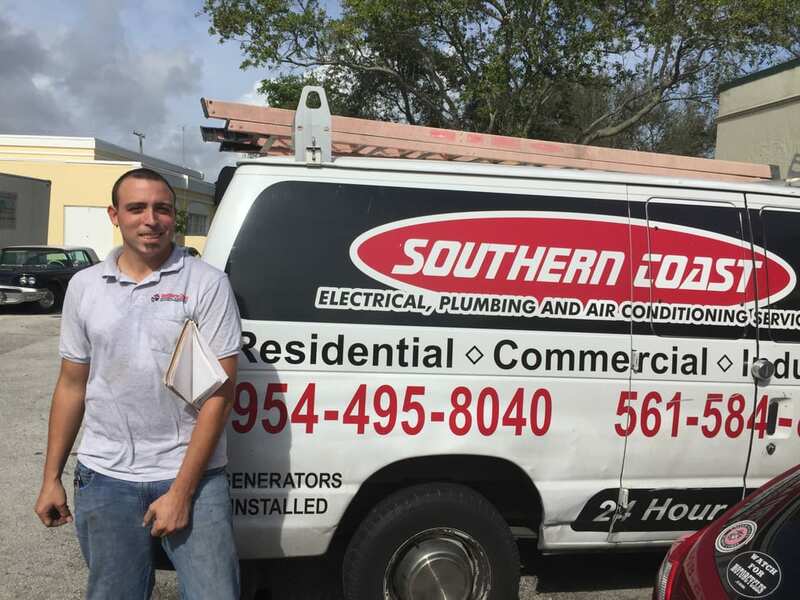 With over 20 years of experience delivering the highest quality service available to our customers in South Florida, Southern Coast has become a leader in the industry with its A+ rating with the BBB. We are the trusted and reliable provider of air conditioning, construction, electrical and plumbing services in Boca Raton, Delray Beach, Palm Beach, Tamarac, Hollywood and the surrounding areas in the Broward County. WE OFFER LIFETIME GUARANTEE ON RECOMMENDED REPAIRS! We are open 24 hours a day, 7 days a week and when you call, you will always speak with a live person. Our experienced customer service representatives will schedule an appointment that is convenient for you. Before our licensed and trained technicians arrive at the appointed time, we will give you a call so you don’t have to waste your valuable time waiting or worrying. Our Service Experts are the best in skill, customer service and workmanship. We provide ongoing training and keep up to date with new market developments and building code requirements in Florida. That means you get the most knowledgeable experts in the business. They will care for your home and complete the job in a timely manner with precision. We accept responsibility for your complete satisfaction with the materials we use and the workmanship we provide to all of our clients. During the first year, if you are dissatisfied with our service, repairs or our technicians for any reason, we will do whatever it takes to make it right and correct the problem to your satisfaction. Southern Coast warrants and guarantees to the original purchaser, that our recommended services or repairs, shall be free from defect in materials and workmanship under normal use and conditions. If you are unhappy with your installation and we cannot fix it, we will remove the system and refund 100% of your original investment at any time during the first year. Period!